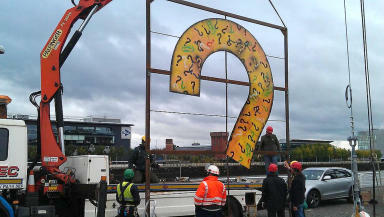 Finnieston crane's new artwork - a dangling question mark - pays homage to the great sculptor George Wyllie MBE. From the hammerhead crane dominating the Finnieston skyline, a huge yellow question mark now hangs. Punctuating the Clyde side panorama, this mysterious mid-air sculpture begs questions of bystanders as it dangles above the river. It transforms the Finnieston Crane into an artistic platform, suspending a grammatical spectacle for all to see. 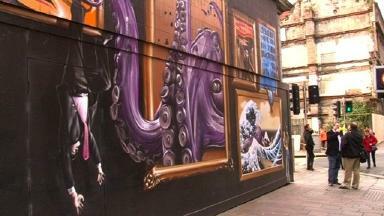 Its apparition is not a social comment or mischievous stunt, but a nod to one of Scotland’s best-loved artists. The late George Wyllie MBE, who passed away in May of this year, is being celebrated in a series of events to commemorate his life’s work in sculpture, public art and performance. Question marks were a prominent feature in Wyllie’s work, as the maverick sculptor spent his career challenging perceptions and creating radical, large-scale public artworks – referring to himself as a ‘scul?tor’ rather than a sculptor, because he believed the question mark was too important to leave until the end of the word. “He was unique, that’s for sure. Definitely a one-off,” says Alec Galloway, the artist behind Wyllie’s commemorative Big Clyde Question Mark. “We focused on the image of the question mark because it was integral to George and his work, it was at the core of what he did. The Big Clyde Question Mark, hoisted skyward on Friday October 12, pays homage to Wyllie’s own crane-suspended Clydeside artwork, the Straw Locomotive, which was exhibited in 1987. Wyllie’s life-size train – crafted from steel and straw at Hyde Park locomotive works in Springburn, was hauled along the old railway line before being winched up into the sky and held there for three months. It was then burned in a ceremonial funeral pyre, in keeping with its creator’s eccentricity. The innovative artist also launched an 80-foot paper boat down the Clyde in 1990, which later sailed all the way to New York, berthing at the World Financial Center before embarking on its epic return voyage to Scotland. Now, 25 years later, Alec Galloway’s Big Clyde Question Mark follows in the Straw Locomotive’s tracks. Welded from steel from Fergusons’ shipbuilders in Port Glasgow and crafted by the hands of the local community, the question mark is not only an ode to Wyllie but a celebration of community art. “When I was commissioned I felt it was important that the community was part of the making and fabric of the piece,” said Alec of his work. “A lot of hands have been part of the making of it - not just artistic hands. Shipyard workers, welders, joiners, woodworkers, painters." Former shipyard workers and community groups from Inverclyde also worked together to create other large question marks as part of the project, which have been installed in mudflats on the shore of Port Glasgow and Langbank. “It’s a little bit similar to the way they would make a ship in a shipyard," said Alec. The Clyde question mark weighs approximately one tonne, and is ten metres high - the equivalent of two double decker buses stacked on top of one another. To suspend it from the crane, five individual segments must be hoisted above head height and then fitted together before being heaved into the sky on cables. Alec, who predominately works with glass and is responsible for many architectural artworks around the city, is a great admirer of George Wyllie and was friendly with the venerable artist before he passed away. Wyllie also unveiled one of Alec's stained glass artworks in Govanhill and was there to impart wisdom, advice and inspiration to the younger artist in his later years. When George’s daughter Louise selected an artist to pay tribute to her father, Alec was honoured to be asked but acknowledges the great responsibility that comes with the task. “It’s quite a daunting prospect I have to say,” said Alec of hoisting his sculpture on the same crane as the Straw Locomotive. 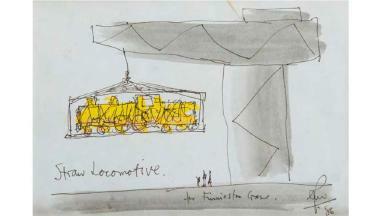 “I think when you’re someone like George, especially the character that he was, a straw locomotive on giant crane was very typical of the thing he would do. “For me it’s daunting as a project because people will compare it to his original powerful piece of work. 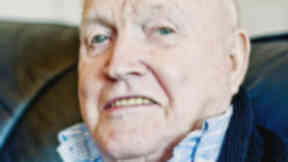 Just before Wyllie passed away at age 90 in May 2012, £158,510 of funding was granted from the Year of Creative Scotland 2012 as part of an initiative to celebrate his artistic legacy. The Whysman festival, which has run throughout the year, has thus exhibited and encouraged the appreciation of Wyllie's work posthumously. The festival culminates in an exhibition entitled George Wyllie Retrospective: in Pursuit of the Question Mark which takes place at the Mitchell Library between November 3 2012 and February 2 2013. Alec's Big Clyde Question Mark is one of the final bold, lively works of public art that will commemorate George and the success of the Whysman festival, while giving his admirers another opportunity to pay tribute to his legacy. "The great thing that struck me about George was his boundless energy, even up to the last year of his life he was still very active artistically," said Alec. "Even when his work became too physically demanding for him, he was a great voice to have in the background and a great inspiration through his words of wisdom." To learn more about George Wyllie and the Whysman festival, visit the Why?sman website. and look out for the second chapter of our video series on Glasgow's public art.